Without state funds, people with extremely low incomes could never afford to live in homes like this one in Spokane Valley. By next week, "Pickle Rick" and "Frank" will be moving from their apartment in Airway Heights to a newly renovated home in Spokane Valley, and they couldn't be more excited. The two women, really named Nichole Locher and Debra Hays, smile at their kitchen table as they share their funny nicknames with the Inlander one afternoon last week in the apartment they've shared for about a year. The roommates both have staff from Assisted Residential Services (ARS) on hand to help them 24 hours a day, and while both say they're happy with their team, there are some drawbacks to their current place. Locher, 39, has cerebral palsy and her electric wheelchair can't easily navigate through the kitchen or halls, which prevents her from doing things like helping put dishes in the dishwasher or grabbing something from the dryer, further limiting what independence she has. Hays, who has a moderate intellectual disability, lost her right leg to diabetes and also uses a wheelchair. The 56-year-old can get around a little easier, but can't really cook as the stove is too tall. "They're very supportive behind what we decide to do," Hays says of the staff. The Paratransit bus, their main link to community activities, can only pick them up at the end of their sidewalk, which in the winter often means having their chairs dragged or pushed through hundreds of feet of unshoveled snow. Their staff have covered the large air conditioner that sticks into their kitchen with a plastic garbage bag and tape to prevent cold air from blowing into the unit all winter. So finding out they had been selected to move into a virtually brand-new home was incredible. 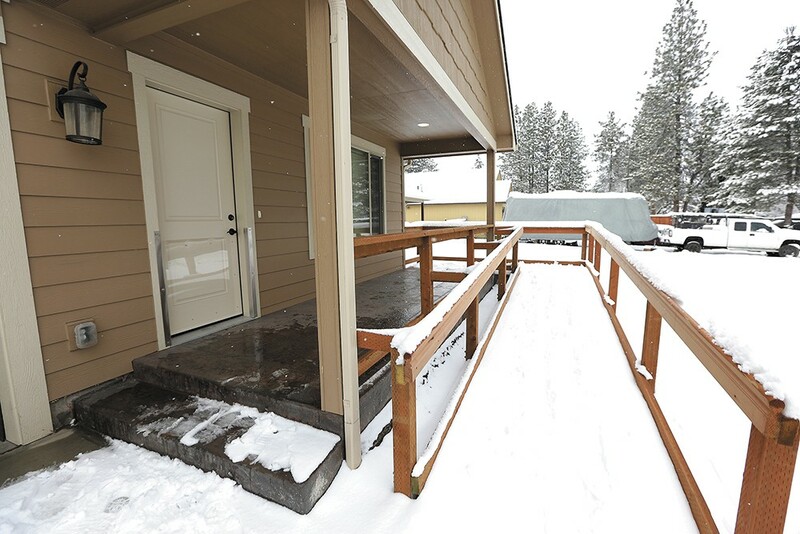 The three-bedroom home in west Spokane Valley has been renovated for wheelchair accessibility, with an exterior ramp, large open bathrooms and metal corner guards throughout to prevent wall dings. There's a large open laundry closet in the hall, heated floors, raised garden beds in the backyard, and Paratransit can come right to their driveway. "It's gonna be a nice home," Locher says. "For our wheelchairs it will be easier to get around." It's the first of four "health homes" in Spokane County being renovated as part of a $1.5 million Washington State Housing Trust Fund grant to provide stable, affordable housing to people with extremely low income and a dual diagnosis of developmental disability and mental illness. And it's the first project in Eastern Washington by Options for Supported Housing, a nonprofit based in Dublin, Ohio, that will serve as landlord for the life of the home, coordinating local property management as needed. For the 12 tenants like Locher and Hays who will move into the four homes, the project will slash their rent, remove concerns that a landlord might price them out of a unit and allow them to age in place as the homes are contracted to remain affordable for at least 30 years. "When people move into one of our properties, we like to think of it as their 'forever home,'" says Kathy Streblo, Options' executive director. 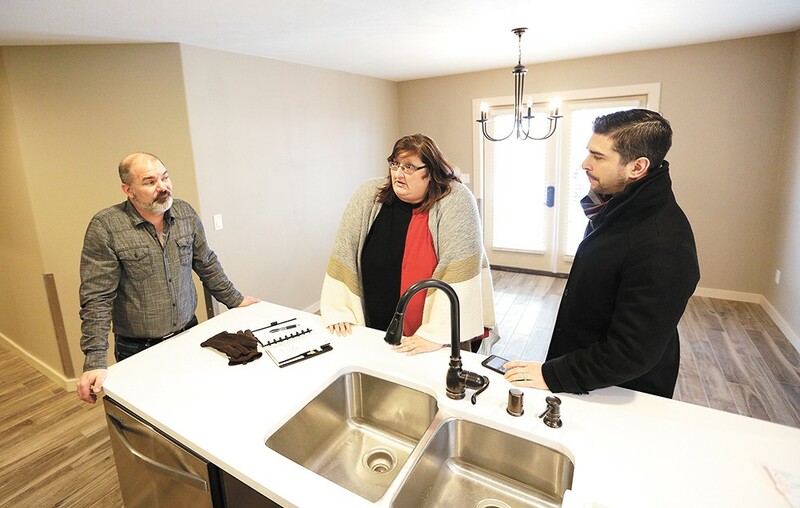 Project Managers Colt Utley and Jacob Pollowitz (left, right) stand with service provider Rachell Redman in the kitchen of a newly remodeled "health home." Part of what drives Options' work is an industry-wide shift to separate landlords from the companies that provide services, so clients don't have to worry about moving if they decide to part ways with their supported living staff, Streblo says. "People need to have an option and the choice to live in what best meets their needs and preferences," she says. That separation also benefits providers, who are often spread thin, as it allows them to focus more on the health and wellness of their clients than on maintaining a property, Streblo says. Importantly, the Spokane project will provide stability and a nicer home than most tenants could ever afford. "What we struggle with is keeping [clients] in a home," says Rachell Redman, ARS owner. Though the agency works with many great landlords, sometimes their clients get priced out of places they love. With Options effectively signed up to be landlords for the life of two homes ARS will be moving tenants into, there will be stability for everyone, she says. "I told Rachell I didn't want to move again," says Hays, who moved into assisted living two years ago. "I was in my own apartment before, but I like ARS, they are really nice." Supported living, Redman notes, is different from a group home, since no staff members live there. "Our staff just come in to support," she says. "This is their home." Options will keep rent low so tenants can spend more money on things that make life enjoyable, says Jacob Pollowitz, a Shoreline-based consultant who manages Options' housing projects in Washington. Currently, Locher and Hays, both on Social Security Disability, each pay about $370 a month, with state assistance covering the final third of their $1,100 rent. The rest of their less-than-$800 income has to cover assisted living, utilities and food, leaving little leftover for day-to-day costs like clothing and activities. In the new home they'll never pay more than 30 percent of their fixed income for rent. With a utility allowance factored in, most tenants effectively pay close to $150, Pollowitz says. "It's allowing them to live in a nice neighborhood, in a safe neighborhood, in a nice home that they can live in for the rest of their lives if they would like to," Redman says. "It's a magnificent program." Hays hopes to have a little more spending money to do activities she loves, like painting ceramics, and Locher loves clothes, so she's looking forward to being closer to the mall. It'll help even with little things, like their mutual love of peanut butter. "If I could buy it by the gallon, I would," Hays says. It's been a little more than a decade since Options for Supported Housing started working in Washington as a builder, developer and property manager. The nonprofit changed its name in October from Foundation for the Challenged to better represent their work and current terminology in the disability community, Streblo explains. By next year, about half of their portfolio of 94 homes will be in Washington, though they manage homes in 10 other states. Part of what's driving them to do so much work here is that Washington allows part of its grant money to go toward future operating expenses. 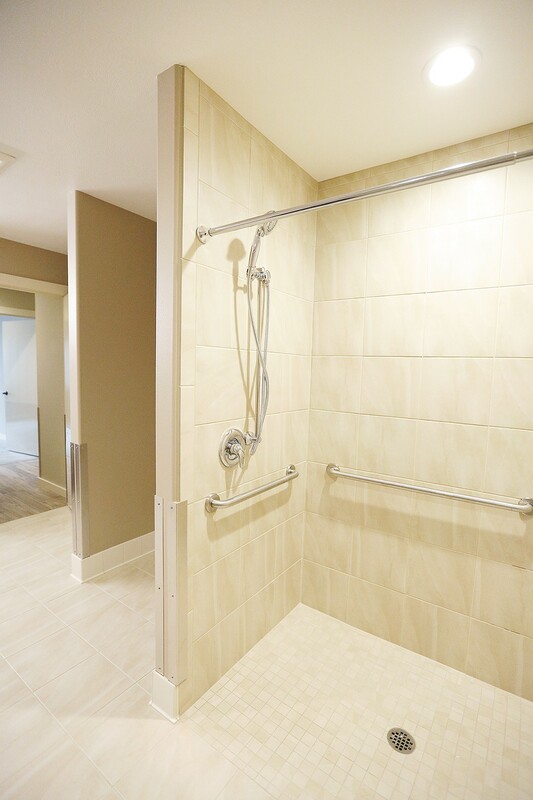 The home includes wheelchair-accessible bathrooms. When there are unexpected costs, a market landlord can raise the rent as much as they need. Options can't. That's significant when state contracts require the housing remain affordable for at least 30 or 40 years, Streblo says. In Washington, they can set aside reserves for repairs, and in many communities, Options blends funding, leveraging Community Development Block Grants and county and city money as available. "In Washington you're able to maintain a high-quality home and make sure it will be maintained over time," Streblo says. "I wish we could help other states find the means to do that." Idaho created a state Housing Trust Fund back in 1992, but hasn't put any money into it at all, something Idaho House Minority Leader Rep. Mat Erpelding, D-Boise, chastised in an op-ed posted on his website last month. "After creating a tool to advance Idaho's economic and housing security interests by incentivizing developers to invest in affordable housing, lawmakers chose not to fund it," Erpelding writes. "If actions speak louder than words, then the politicians in charge are making it clear they don't care about Idaho's small towns." Washington, meanwhile, appropriated $6 million in the 2016 supplemental capital budget just for four projects, including the one in Spokane, and has hundreds of millions of dollars in spending mapped out for coming years. While it's not a one-size-fits-all system, generally speaking, it is cheaper to care for these clients in a community setting than a medical setting, Streblo says. Most of the 40 homes Options has renovated in Washington are designed to meet accessibility needs clients may have down the line. "We want tenants to age in place because we know that housing is not available for people who don't make a ton of money," Pollowitz says. "Because they're not in a wheelchair tomorrow doesn't mean they won't be in 10 years or 20 years or 30 years." Importantly for clients, their homes are integrated into the community, Streblo says. The original print version of this article was headlined "'Their Forever Home'"